Three miles north of Whitefish, the Stillwater Fish House is an oasis in a land of Big Red Meat. Though Montana isn’t often perceived as a seafood mecca, owners Jesse and Adrienne Felder are doing their part to alter that. 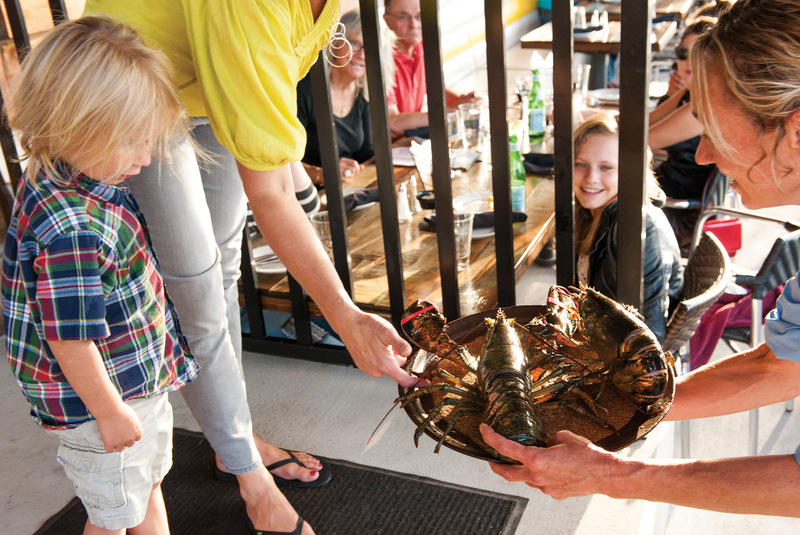 Open since July 2012, the Stillwater Fish House celebrates the very best of what is hauled from lake and sea. 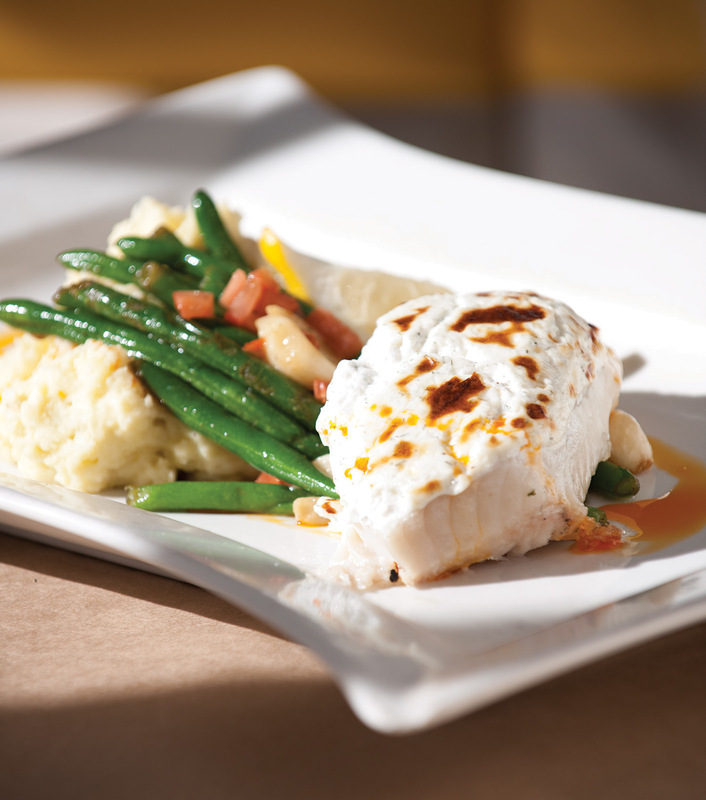 Trout, salmon and whitefish are the obvious fresh local fare. Add to that an abundance of fresh halibut, butterfish, tuna, lobster, shrimp, crab and oysters flown in three to six days a week, and it’s easy to see why diners are hooked. Jesse and Adrienne started this venture in 2011 when they moved cross-country, relocating from Austin, Texas. They bought, renovated and opened the restaurant, and had their first child, all inside of eight months. Their vision for the restaurant was to bring something new to the community, something about which they were passionate. 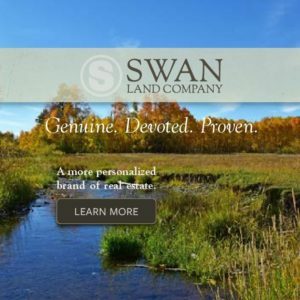 “We filled a niche. The concept was scary but we stuck to what we believed in,” says Adrienne, an avid pescatarian. “What I find most rewarding is being together, doing things together. 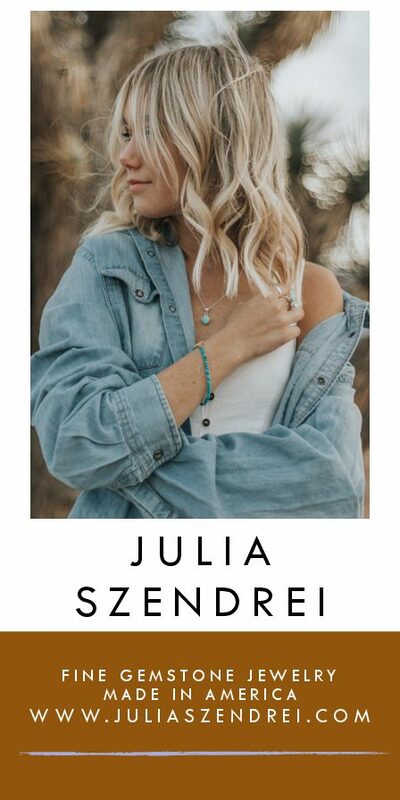 I mean this not just with Jesse as my husband and business partner, but with the community and our staff. … We’re very open about our goals. We took this basically open slate that was once a restaurant and turned it into something new. The Stillwater provides a respite for the serious business of eating, and patrons travel from all over to partake. I talk to diners from Canada, Polson, Kalispell and Nebraska. Minnesotan Jim Hansen has been coming to Whitefish for the past 30 years. “I drove by here last year and decided to stop,” he says. He enjoys the house favorite, miso butterfish, a delicate flaky fish marinated for 48 hours then sautéed and served with an imported white miso reduction glaze, and fresh edamame salad with Asian style dressing. A Phoenix couple sits in front of the window with their seven-week-old son. Between bites of calamari they inform me that this is their first visit. “Delicious!” they keep exclaiming. A raw bar favorite is the hamachi crudo, a Pacific yellowtail in a ponzu-sesame dressing with pickled red onion, jalapeño and fresh lime. A server walks by with complimentary hush puppies, made in a dedicated gluten-free fryer using rice flour instead of wheat. The Stillwater Fish House easily accommodates food sensitivities and preferences with vegan curry, dairy-free and gluten-free entrée options. And yes, of course you can order steak or chicken if seafood isn’t your thing. At the bar, Danner is both bartender and master shucker, serving up nearly 12 dozen oysters a night. He jokes easily with two regulars at the bar while prying his knife into the shellfish. 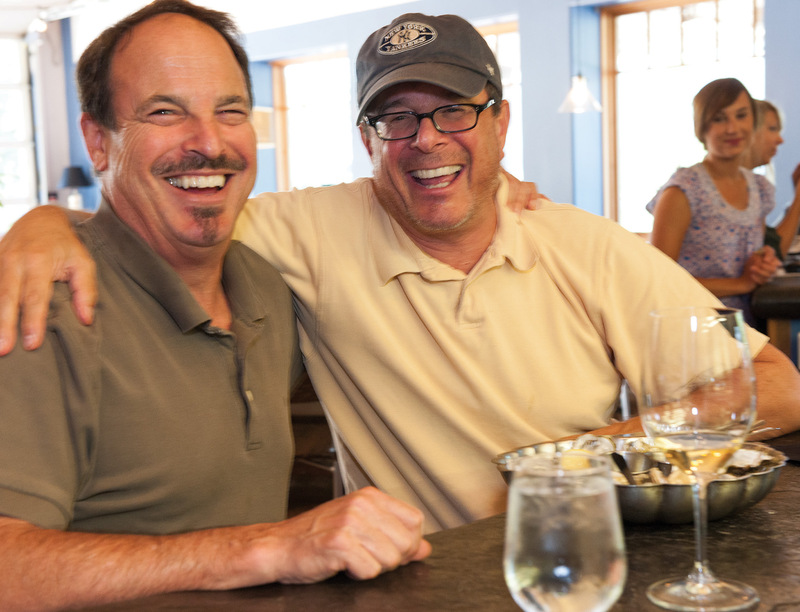 The Stillwater offers 20 wines by the glass and local craft beer. Danner shucks, serves, pours and repeats. He stands in front of a glass partition that prominently displays the kitchen in action. As general manager and owner of Stillwater Fish House, Jesse Felder is everywhere. I watch him adjust table settings, greet people at the door and chat with patrons. He expedites things in the kitchen then preps salads on the line. In rolled up starched sleeves, he carries food out to the dining room. 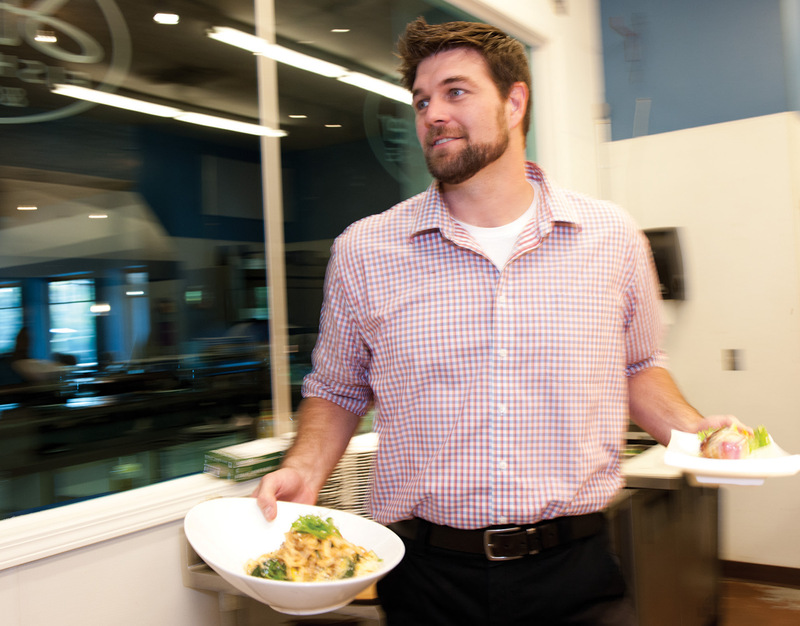 “He’s been known to jump in and wash dishes on occasion,” says executive chef Christopher Maher. “Every day he puts on an apron and comes into the kitchen. He loves baking and trying new things. He truly loves to cook.” As much as he’s willing and able to take tasks on himself, Jesse fosters creativity in his staff. “I have no creative restrictions,” says Maher. Based on customer feedback and his own innovations, Maher adds and amends dishes, evolving the menu while using the finest local organic foods and a steady supply of river, lake and sea fare. With more than 30 years of culinary experience, mostly in Aspen, Maher adds an Asian influence to the Stillwater menu with dim sum, pot stickers and noodle bowls. Currently, however, his personal favorite is paella: a traditional Spanish dish featuring seafood, rice and vegetables. Maher is an award-winning soup maker, having earned first place at the annual Aspen Soup Skol competition. “I had a customer who came in here for dinner but wound up eating two bowls of soup instead,” he says. It was the roasted red pepper soup with shrimp and basil dumplings. It’s that good. The dining room and both patios are nearly full when I depart. Reservations are suggested. The Stillwater Fish House is open seven days a week year-round on Highway 93 north. Folks come by car, bus, bicycle or horse (there’s a hitching post in the back). Sautée the onion, celery, carrot, ginger and garlic in the sesame oil in a medium stockpot over medium high heat for about 3 to 5 minutes or until the onions become translucent. Deglaze the pan with the mirin and cook for another 3 minutes. Turn the heat to high and add the lobster base, soy sauce, fish sauce, water, coconut milk and brown sugar. Mix well and bring to a boil for 3 minutes, then remove from heat. Transfer soup to a blender (or use an immersion blender), blend until smooth. Season to taste. Keep warm until serving, or let come to room temperature then freeze in gallon freezer bags. Add crab 5 minutes prior to serving. To dress up the presentation, ladle into a bowl and add a dollop of crème fraîche then garnish with fresh, chopped flat leaf parsley. 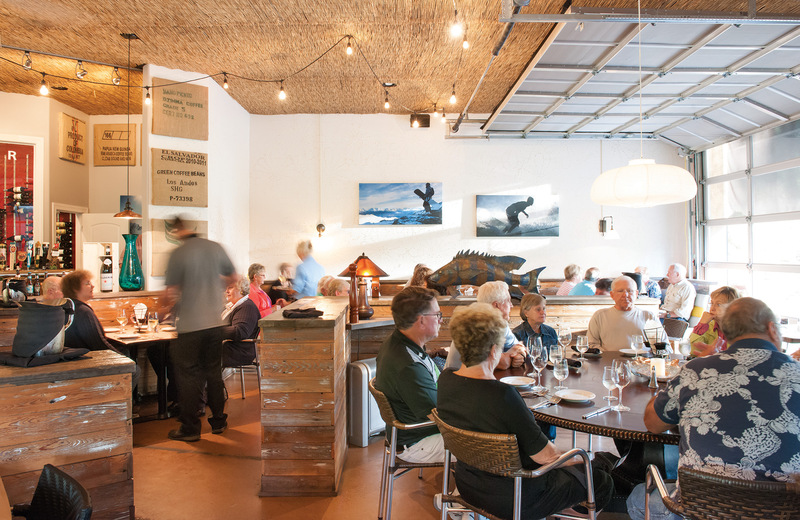 With overhead glass-paned garage doors, surf art, grass mats and warm-toned reclaimed wood, the Stillwater dining room is bright, cheerful and inviting for the business of eating. 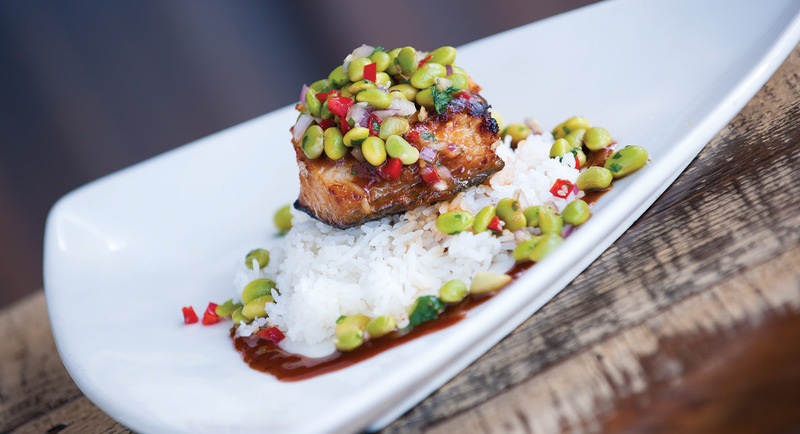 A Stillwater Fish House favorite, miso butterfish, marinated for 48 hours then sautéed and served with an imported white miso reduction glaze and fresh edamame salad with Asian style dressing. 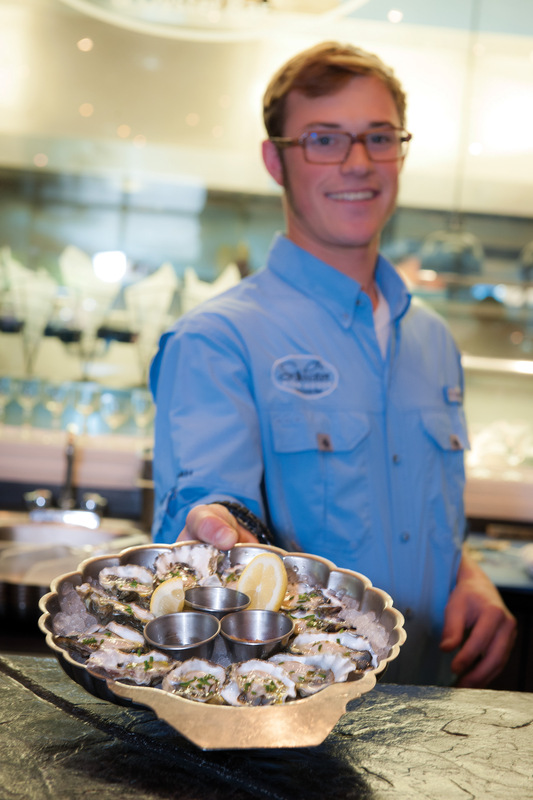 Danner is both bartender and master shucker, serving up smiles and seafare. 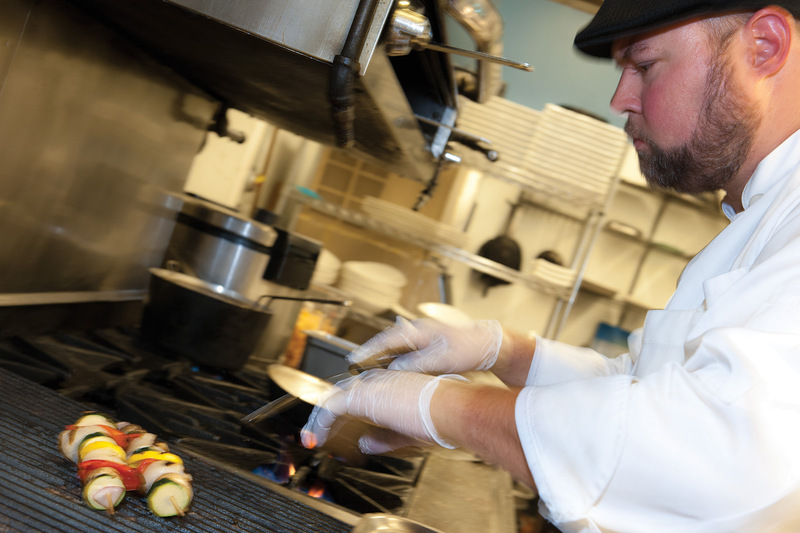 Sous chef Gabe Elam prepares grilled scallop kabobs. Grilled, sautéed, baked, boiled, fried; sizzling seafood at the Stillwater Fish House. Daynna introduces a shy young patron to his dinner guests. Young and old, near and far. The Po family from Phoenix enjoys calamari while their 7-week-old son snoozes contentedly. On the go. Owner Jesse Felder works the kitchen, dining room, front door, behind the bar and even the guitar.